Four Below by Peter Helton, a Mysterious Review. 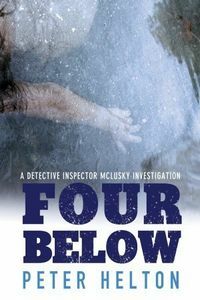 Review: The arrest of a major drug lord creates a power vacuum in the criminal underworld of the city of Bristol, putting the police on edge during what they believe is the calm before the storm in Four Below, the second mystery to feature Detective Inspector Liam McLusky by Peter Helton. It is a bitter cold November, adding stress to an already tense situation. As the police search the streets and alleys for junkies willing to talk about their sources, they come across a user dead from what appears to be anthrax. A not so subtle message from someone? Separately, strips cut from a photograph are being sent to the Bristol Herald that seem to be related to the increasingly violent clashes between gangs jockeying for power. McLusky and his team have their hands full trying to understand what's happening in their city and, more importantly, what they can do to stop it. This fast-paced mystery is centered on the new man in Bristol's Albany Road Station, someone who got the job over one of their own. He has to adjust to his new environment — the situation with his office, a converted cupboard with a radiator that blasts waves of tropical heat, offers a humorous balance to the seriousness of the crimes being investigated — and win himself over to his new colleagues. McLusky is a terrific series character, one not above breaking a rule or two to get the job done. This is a series definitely worth following. Special thanks to guest reviewer Betty of The Betz Review for contributing her review of Four Below. Acknowledgment: Soho Press provided an ARC of Four Below for this review.